4746 exhibits have been collected in the museum foundation reflecting the life and activities of national leader Heydar Aliyev. The words about our native Azerbaijan said by Heydar Aliyev were written in the centre of exposition hall. In the first section of the museum are placed: the portrait “President Heydar Aliyev” painted in a classic style with oil-paint on a canvas, photos taken in different times, documents, the flag which was accepted in Nakhchivan on 17 November 1990 and placards. In the second section are put oil-lamp, the official telephone, the clock, the vase, note papers, pencil-box used by national leader Heydar Aliyev in his cabinet when he was leader of Nakhchivan AR in the years 1991-1993. In the third section the copies of different state rewards, documents belonging to his study years, medals and stamps issued in honour of 80,85 and 90 jubilees of national leader Heydar Aliyev and memorial things are demonstrated. 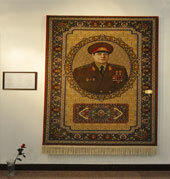 The fourth section consisits of weaving carpets in honour of respectable Heydar Aliyev. 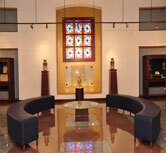 The exhibiting personal things of national leader Heydar Aliyev in the fifth section is in the line of the most valuable exhibits of the museum. All these and other exhibits demonstrated in the museum: decisions and decrees accepted by great leader, signed reports and contracts, letters and telegrams which were sent to the national leader reflect different moments of the honorable way and create full imagination about Heydar Alirza oglu Aliyev`s rich statehood and social-political activities.